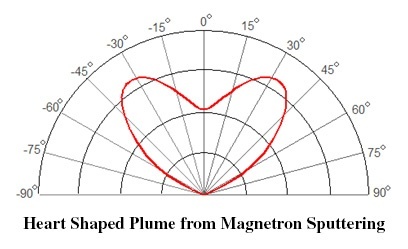 PVD Products teamed up with Tin Model, LLC to explain the connection between magnetron sputtering processes and Valentine's Day. 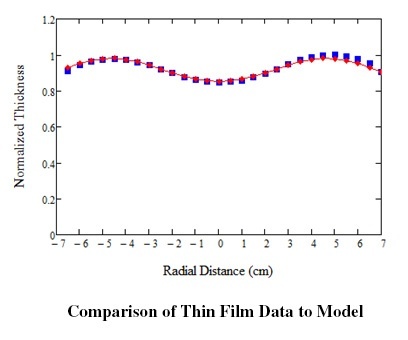 Thin-film materials deposited via sputtering processes can vary widely both in properties and in thickness distribution. This is partially because vapor plumes emanated from magnetron sputtering sources can take various shapes, depending on the design of the magnetron, the material, the state of erosion and other influencers. Knowing the vapor plume of a sputtering source is crucially important for us to predict, optimize and exert control over the thin film deposition processes. When can it be more appropriate than today for us to point out that magnetron sputtering sources often possess a heart-shaped vapor plume? The following is the plume function of a zirconium (Zr) target on a 3” planar magnetron. This plume function can be described by a two-term polynomial of the cosine, which was first suggested by Yamamura (1991). Determination of plume functions can be accomplished by fitting plume-function parameters to experimental data with the help of numerical modeling. The above plume function was obtained through least-square fitting of plume parameters to measured thickness values on a rotating substrate of 6” diameter, with the help of a numerical modeling tool provided by Tin Model. 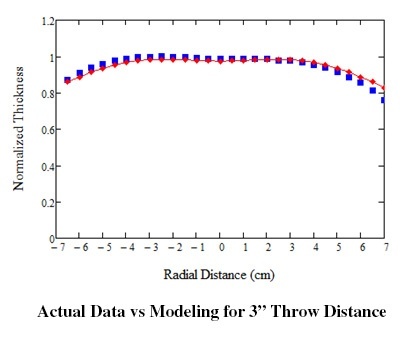 This plume function produced the thickness distribution across the 6” diameter, shown below, with the target placed at 3” offset from the rotation axis and at a 2.5” throw distance. The blue squares are experimental values and the modeling values with the above-shown plume function are shown with red and connected dots. Knowing the plume function of the sputter source one can then predict the thickness distribution when the geometric arrangement inside a chamber is changed. 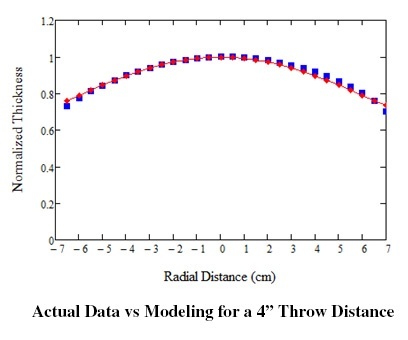 The following two figures show the comparison of model predictions and actual thickness distributions for the same target placed at a throw distance of 3” and 4”, respectively. Again, blue squares are experimental data; red and connected points are model predictions. We note that “Valentine-shaped", or heart-shaped plume functions are commonly observed from other metals as well as dielectric materials, particularly when the target is new. The recognition of heart-shaped plume functions and their changing characteristics when targets become eroded is essential towards a more complete understanding of sputter-deposition processes. The ubiquitous heart symbols at this time of a year make it an ideal occasion for us to emphasize this fact of magnetron sputtering.